After we had survived #snowmageddon2015, those on the East Coast were anxious to see if the groundhog would put an early end to the region's winter cold snap. 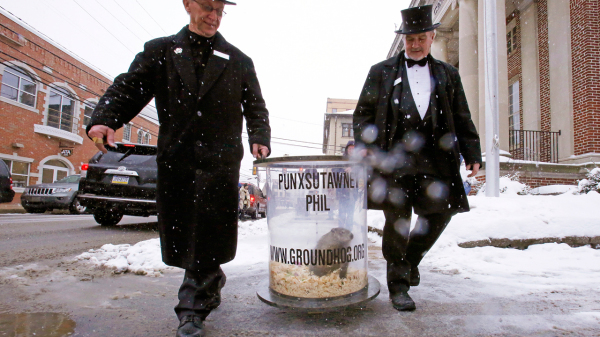 And the verdict is in: Pennsylvania's Punxsutawney Phil saw his shadow on Monday morning at 7:25 a.m., meaning there will be six more weeks of winter. in predicting an early or late spring, which doesn't bode well for the little critter's credibility. 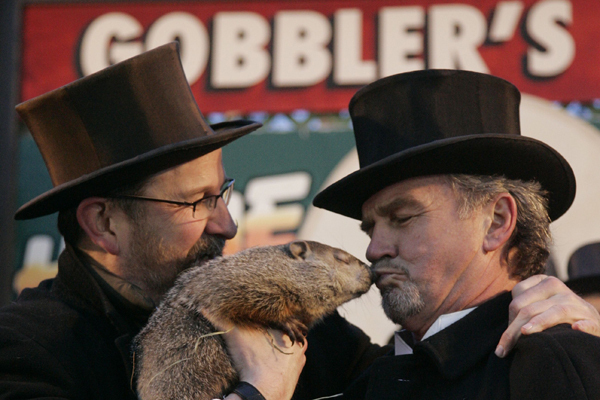 Here are some other interesting facts about the tradition of Groundhog Day. 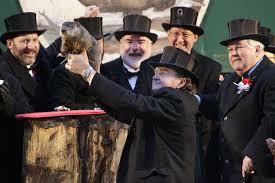 The first Groundhog Day was held on Feb.2, 1887 in Punxsutawney, Pennsylvania. The tradition of using an animal to predict the weather was not new to the German immigrants who came to Pennsylvania; however, they usually relied on badgers and bears. The tradition originated from a German holiday called Candlemas Day, the day between the winter solstice and spring equinox. If the sun came out, there would be six more weeks of winter. The spectators came together on a hill called Gobbler's Knob to celebrate the weather-forecasting before heading to the Punxsutawney Elks Lodge to dine on Groundhog dishes including a "groundhog punch" that consisted of vodka, orange juice, milk and eggs. Yeah, that's right, they ate groundhogs. When the famed Punxsutawney Phil's celebrity began to rise, the Groundhog Club members who held the annual ceremony decided to ditch the rodent from the menu. The tradition goes that if the groundhog pops his head out of his hole and sees his shadow, there will be six more weeks of winter. If he doesn't, then we are in luck for an early spring. Even though this is a fun tradition, science says that the groundhogs come out during this time of the year to search for a mate. "At this time of year, males emerge from their burrows to start searching for the females," says Stam Zervanos, professor of biology at Penn State Berks. "The females come out probably seven days later and stay just outside of their burrow or maybe just inside their burrow." The groundhogs then go back to hibernation, knowing exactly where their mates are for when they all come out in March. Punxsutawney Phil doesn't even come out in search of his mate because he doesn't hibernate at all. Instead, he lives in a temperature-controlled man-made burrow. 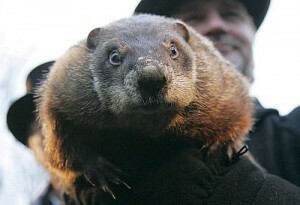 Although Punxsutawney Phil is the most famous weather-predicting rodent, his is not the only one. Other groundhogs include General Beau Lee from Atlanta, GA; Wiarton Willie from Ontario, CA; Sir Walter Wally from Raleigh, NC; Jimmy from Sun Prairie, WI; Birmingham Bill from Birmingham, Alabama; and Staten Island Chuck from Staten Island, NY. New York Major Bill de Blasio dropped Staten Island's Chuck last year, which was a female named Charlotte. She died a week later because of internal injuries. Mayor Jonathan Freund of Sun Prairie also had a mishap when Jimmy bit his ear this year. Birmingham Bill took off this year after the Birmingham Zoo announced "Birmingham Bill will be taking a break this Groundhog Day" on its website. Thousands of people come to see Punxsutawney Phil each Feb. 2, but overall attendance increased after the popular Groundhog Day starring Bill Murray in 1993. The highest attendance was 35,000 people in 1997. Last year 18,000 people came out, even though the holiday fell on Super Bowl Sunday.